Edrington GTR is to launch a peated Macallan expression, The Macallan Rare Cask Black, which will be displayed at the upcoming TFWA World Exhibition. The Macallan Rare Cask Black will be exclusively available in global travel retail from October. Crafted from less than 100 predominantly first fill, Sherry seasoned European and American oak casks, the “remarkably rare” release is part of the 1824 Masters Series. 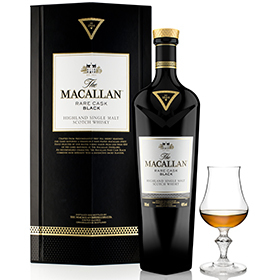 “We are very excited about the coming launch of The Macallan Rare Cask Black, which includes whisky from the few casks of peated Macallan liquid available,” Tellis Baroutsis, managing director, Edrington Global Travel Retail, told The Spirits Business. Given tasting notes include dried fruits, nutmeg, ginger, polished oak, dates, figs, raisins, and a dry smokiness which “reveals itself yielding to softer oak tones”. The finish is “long, fruity with an elegant wood smoke”. The Macallan Rare Cask Black is bottled at 48% abv with an RRP of US$450. There will be no further production beyond the initial release, which is available from “selected airports”. Edrington GTR has also announced the launch of two “exciting, very limited editions” set for early 2016. Macallan Golden Age of Travel has an RSP of USD40,000, while Highland Park King Christian I has an RSP of GBP3,750. The first Macallan Rare Cask edition launched in the UK market in July. I’ve read with great interest your description of The Macallan Rare Cask Black. Do you know which airports carry this, and whether it could be purchased online? Are there any left? I have never heard of a peated Macallan, so I’m very curious to give this a try.